Jonathan Street is a struggling composer when he meets and marries Annette. The problem is that Jonathan was drunk and does not want to be married. Annette does go with him to Paris and does the cooking and cleaning. To get his music published, Annette takes it to Paul and he is won over – by her voice and not the music. So he manages her career and she becomes a star as an opera singer everywhere she goes. Since Jonathan cannot sell anything he writes, he leaves Annette. That makes Annette sad as she wants only to be his wife. If Columbia could make an acceptable movie star out of opera-diva Grace Moore, then RKO Radio could do the same with Lily Pons. At least that was producer Pandro S. Berman’s reasoning when he cast PONS in the 1935 musical romance I Dream too Much. The actress plays Annette, a rural French musical student who marries struggling American composer Jonathan (Henry Fonda). Possessed of a splendid singing voice, our heroine rises to fame on the opera stage, while poor Jonathan continues struggling, supporting himself as a tour guide. 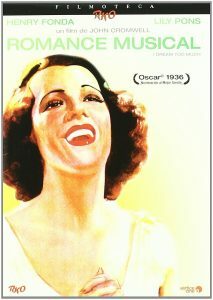 Annette eventually saves her marriage by transforming her husband’s “masterpiece,” a rather turgid modernistic opera, into a light-hearted musical comedy. Annette Monard (Lily Pons): Don’t you think you could stand me? Just for a little while? Just so I could get away from here? I would cook for you and make your bed, and I would try to put on a little fat. Jonathan ‘Johnny’ Street (Henry Fonda): No. It’s impossible. I’d treat you very badly. You’d interfere with my work and I couldn’t have that. I’d probably beat you! Annette Monard (Lily Pons): Of course! But I wouldn’t care! Roger Briggs (Eric Blore): I’m a waiter now. It’s a shocking profession. One learns how dangerous eating really is. Now you take that caviar for instance – that’s probably teeming with ptomaine. Roger Briggs (Eric Blore): Yes, she died in my arms. Oh, it was beautiful… Have you ever had a seal die in your arms? Jonathan ‘Johnny’ Street (Henry Fonda): No, I never did. Paul Darcy (Osgood Perkins): Are you mad? Annette Monard (Lily Pons): Yes I am – and I like it!